Not many historic, luxury resorts can say they have their own ski slopes on property, but then again, The Omni Homestead isn’t like most resorts. The resort is one of only two in the Southeast with a Rossignol Experience Center featuring Rossignol’s award-winning Experience skis with Auto Turn Rocker and the latest ski innovations. This provides skiers of all ages and abilities with more versatility, ease-of-use, and progressive all-mountain performance than ever before. Beginner to advanced skiers will benefit from the unique combination of our Sepp Kober Ski School and Rossignol Experience Center. Non-skiers can ice skate on our outdoor rink, try snow tubing or warm up with fireside s’mores and hot cocoa at the Mountain Lodge and call it a perfect day. 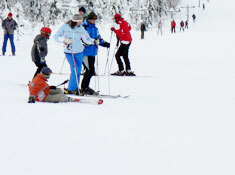 **Special group discounts and “free” ski and snowboard lessons with rentals for groups of 15 or more people! For more information, contact Seth Shreve at [email protected]. 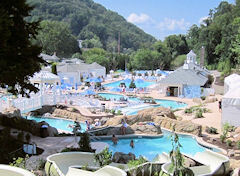 Allegheny Springs Winter Wonderland offers ice skating and swimming throughout the colder months. Full-day and half-day ice skating passes as well as skate rentals are available. Hotel guests can take a dip in the steamy waters at the heated, spring-fed outdoor pool and relax on chaise lounges surrounded by mountain landscape. Winter is a season of fun at The Omni Homestead. This year, the resort is adding mini snowmobiles to its popular cold weather amenities of skiing, snowboarding and tubing. Located adjacent to the Mountain Lodge, the mini snowmobiles will provide thrills for children ages 6 to 12. Also, guests will now be able to enjoy ice skating as the rink is relocated next to the Mountain Lodge. Complementing the winter activities is Kober’s, the new dining outlet at the Mountain Lodge named for Sepp Kober, the father of Southern skiing. Kober’s will feature brisket, pulled pork, ribs, chicken, chili and more for lunch and dinner throughout the season. Since its inception in 1959, The Omni Homestead ski area has been known as an ideal place for novice skiers. The Sepp Kober Ski School offers daily group and private ski and snowboard lessons for ages 4 and older while the Little Penguins program is a half or full day experience for ages 5 to 11. The Family Learn to Ski package is a value for families with lift tickets, rentals and group lessons for a family of four. The resort’s Ridge Runner Zip Tour and Red Tail Racer dual zip line offer guests another way to experience the mountain views of the area. The Ridge Runner’s eight zip lines span more than 4,000 feet while the Red Tail Racer stretches 1,300 feet from mid-station to the Lodge. Known for its year-round, outdoor adventures, The Omni Homestead also has a host of other activities such as the Cascades Gorge Hike, horseback riding, archery, carriage rides, falconry and hayrides. 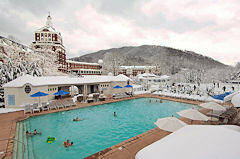 The resort’s outdoor and historic indoor pools are the perfect places to relax after a day on the slopes. Other activities include the fascinating daily history tour, nightly movies, Southern Social hour and shopping, along with the family-friendly game area, DownTime. For the ultimate aprés ski experience, guests can pamper themselves in the resort’s expansive and luxurious Spa. A full menu of services including facials, massages, body treatments, manicures, and pedicures is available for ages 5 and older. The adults-only Serenity Garden, which features the resort’s natural hot springs, and the Aqua Thermal Suite are complimentary with all 50-minute or longer spa services. In addition to Kober’s, the resort offers a variety of dining options from casual to formal. The elegant Dining Room, which serves breakfast and dinner, is a traditional resort dining experience and ideal for celebrating special occasions. Jefferson’s Restaurant and Bar are guest favorites for lunch and dinner. For dinner, Jefferson’s Restaurant features prime steaks and seafood while Jefferson’s Bar is a great place to grab a sandwich or snack and watch a game on the large screen TVs. Pizza and pasta aficionados enjoy the Casino restaurant with its wood-fired oven and menu of Italian specialties. 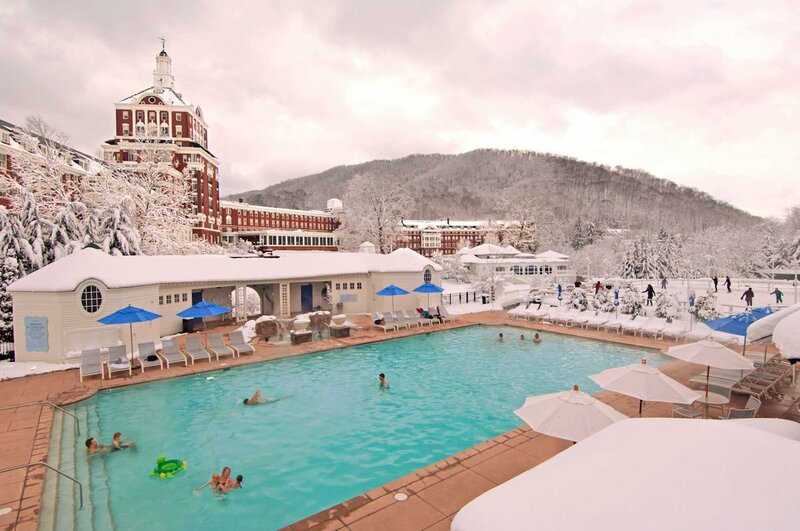 Two words can be used to describe the unmatchable amenities at The Omni Homestead – “Oh My!” They offer a variety of restaurants, a spa and salon, ski shop, ski school, special Omni packages and much more. For incomparable luxury accommodations and amenities, you may want to stay at The Omni Homestead, a National Historic Landmark in Virginia’s Allegheny Mountains. The Omni Homestead is a year round destination featuring 2 championship golf courses, including the world famous Cascades Course, a luxurious spa, shooting sports, hiking and biking trails, tennis and a new zip tour. The suites have traditional furnishings and decor with Georgian architecture. The Omni Homestead has more than 483 guest rooms and suites on site. Enjoy the Main Dining Room, Jefferson’s Restaurant and Bar, Casino Restaurant, Mountain Lodge, Martha’s Market, Lobby Bar and DownTime (a family game area).